It's very easy for media elites in Manhattan to decide that one tweet can prove small towns in Wisconsin are stuffed with racists and anti-Semites. On Nov. 12, ABC, CBS and NBC all leaped on a tweet from a contributor of the left-wing talk show "The Young Turks." 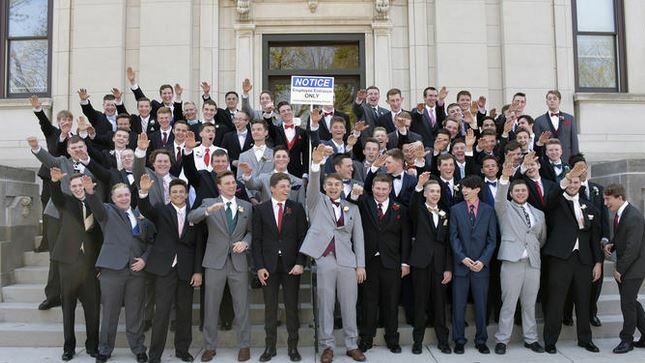 It showed a months-old prom photo of a collection of teenage boys from Baraboo High School in Wisconsin who are positioned on the front steps of the Sauk County Courthouse and appear to be giving a "Nazi salute." The town of about 12,000 — best known before now as the original headquarters of the Ringling Brothers and their circus — quickly felt the sting of national, and even international, embarrassment. The Auschwitz-Birkenau Memorial and Museum tweeted its outrage and attached a link to history lessons about Nazi Germany. This was followed by everyone insisting this photo isn't representative of the local population, as well as school officials promising to investigate. But what really happened? Student Brock Turkington said it started when the photographer said, "Do a 'hi sign.'" He added: "And nobody really understood what a 'hi sign' was. We'd never heard of it. And he demonstrated by sticking his arm up, kind of what the salute looked like. So we all kinda imitated it." When Turkington saw the photo later, he winced at what it looked like. "It was just miscommunication, like, we were told to do one thing, and he demonstrated it badly, and we all kind of just followed along because we just kind of wanted to get the pictures over with," he said. "In this picture are many of my friends that I know are not racist and do not hold Nazi views."